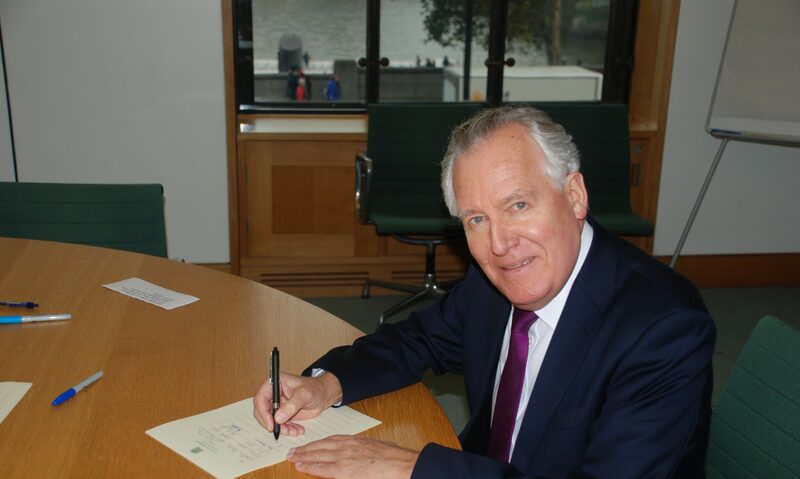 Former Welsh Secretary Peter Hain – one of Labour’s most senior figures – has urged his party to abandon its commitment to more cuts if it returns to government after May’s General Election. ‘The obsessive pre-election debate surrounding still more savage cuts to “cure” the deficit is based upon a whole series of deceits. The first of these is that the last Labour government left the country with a mountainous levels of national debt, a budget deficit and the need for public borrowing because we spent too much. In truth Labour cut national debt as a share of national income from over 42 per cent inherited from the Conservatives in 1996-97 to less than 30 per cent in 2001-02; though it rose to 36 per cent by 2007-08, that was still well below Tory debt levels. Britain’s national debt as a share of national income was lower than that of France, Germany, the US, Italy or Japan, having fallen by 6 per cent since 1997 (worth some £90bn today). Lower government debt meant Labour saved the taxpayer about £3bn in annual interest payments: we did indeed “fix the roof when the sun was shining”. This helped to establish a stable economic foundation and delivered a decade of record investment in public services that so desperately needed repairing; from the dismal inheritance of patients dying on trolleys in hospital corridors and sinking school standards to the worst railways in Western Europe. By June 2007 Labour had delivered a historically unprecedented decade of steady economic growth, low inflation and low interest rates which had taken employment to record heights as GDP per head grew faster than for any other member of the Group of Seven leading developed economies. The low yields on government bonds before, during and after the 2008 credit crunch under Labour bore eloquent testimony to the fact that the international markets had full confidence in our policies; and that they were not clamouring for the right-wing cuts dogma subsequently visited upon Britain. Before the global financial crisis, government borrowing was some £15bn lower in today’s money than in the Tories’ last year in office in 1996-97. In fact the Tories have borrowed more money in the last five years than Labour did in the entire 13 years of our government. International Monetary Fund figures showed that Britain’s 2007 public sector deficit, at 2.7 per cent of GDP, was also low: the same as that of France and the US. The deficit too had been significantly cut from the one Labour inherited. Indeed, so desperate was he to identify with Labour’s success that David Cameron in September 2007 even pledged to match Labour’s spending plans for three further years up to 2010. In his subsequent lurid, repetitive denunciations of “Labour bankrupting Britain” he seems to have been struck by a prolonged bout of amnesia. Labour’s spending was in fact lower than in France, Germany, the Netherlands, Norway and Sweden, and was never “out of control”. But then came the international banking crisis, the global credit crunch and the worst recession in Britain for 80 years. The proposition that by building so many new hospitals and new schools, by recruiting tens of thousands of extra nurses, doctors, teachers and police officers in Britain, Labour triggered the subprime mortgage defaults in the US that ricocheted throughout the world’s financial institutions is preposterous. It wasn’t Labour’s public spending that triggered Britain’s or the world’s economic crisis. It was the global interdependency of reckless banking practices that in 2008 caused an economic meltdown in Britain and right across the globe. Britain under Labour, just like the other G20 governments, took on record annual budget deficits by agreeing to boost public spending and borrowing through multi-billion bank bailouts. But these were deficits which stopped a banking collapse and a slide into slump; and also laid the basis for recovery from the biggest shock to hit the world economy in peacetime since the 1930s Great Depression. However the new Tory-led government that took office in May 2010 embarked upon massive and immediate public spending cuts which turned a fragile but real recovery from the banking crisis under Labour into a fresh recession under the Tory/Lib Dem coalition. The budget deficit wasn’t caused by Labour’s “reckless spending and borrowing”, but by irresponsible bankers. Today after all the cuts, the deficit is still more than double the target in the Tory plan for this Parliament. And yet – cheered on by the Daily Mail, Telegraph and Murdoch stables and echoed by broadcasters – their plan of action is still more savage cuts if they win. It may be good politics for the Tories, leading Labour on the economy according to pollsters. But it is lousy economics, because it hasn’t worked. Before the last election David Cameron luridly trumpeted that Labour’s commitment to halve the budget deficit would take Britain over “the brink into bankruptcy”. It was necessary to eliminate the whole deficit he insisted, pledging to cut government borrowing by 2014-15 to exactly half what Labour had planned, £37bn instead of £74bn. Yet official forecasts expect government borrowing to exceed £91bn – nearly £20bn more than Labour’s allegedly “disastrously high” target, and over £50bn above the Tory one. So the Tories have simply moved the goalposts, insisting their “plan” is working after all. The problem is that none of this deceitful propaganda confronts the fact that the kind of capitalism we face today is a more financially unstable and more unfair system than ever before: productive but prone to paralysis, dynamic but discriminatory. My book, Back to the Future of Socialism, explains why and provides a practical political alternative to reform Britain’s economy and generate sustainable growth. It confronts the right wing orthodoxy of recent decades – an ideology favouring market forces wherever possible and tolerating state regulation only where absolutely necessary. Although that same ideology caused the banking crisis, it has clung on nevertheless, as if somehow it were not the very root of the problem all along. He made no mention of irresponsible bankers, still less of the failure of politicians to control them. The entire global banking crash was apparently nothing to do with Big Finance: it was all the fault of Big Government. The cause was too much public spending – not too little public regulation. But the real culprit was that governments across the world (including Labour’s) allowed the financial system over a 30-year period to get out of control and become a law unto itself. Takeovers and mergers led to banks so big they couldn’t be allowed by government to fail. Bankers bent rules to lend ever more riskily without anything like enough capital cover, until it all unravelled to catastrophic effect. In truth – at the very least in terms of finance – governments were too small and too passive, not too big and too active. Back to the Future of Socialism explains why and insists that the real choice facing voters in the May election should be between the right’s insistence on minimalist government and the left’s belief in active government; between the right’s insistence on a free market free-for-all, and the left’s belief in harnessing markets for the common good.